Boston is teeming with tourists at this time of year. People pour into the city in droves for the Fourth of July fireworks and Pops concert. Taking a tour on a trolley or a duck boat are wicked popular, and new companies seem to be popping up all the time. The other day, I noticed a new tourist office across from the Park Street T station. Shockingly, its sign misuses it's! I almost told the guy working there to fix the mistake, but he didn't look like he would understand what I was talking about. The errant apostrophe in this sign is ironic since it's in reference to Harvard and MIT, two of the nation's finest universities. I've got some Boston pride (Go, Celtics! ), so I was kind of embarrassed by this particular apostrophe catastrophe. Borders...language...culture. Without these our country is doomed. I Just stumbled across your blog- great site! "it's" is one that bothers me most. Ditto the irony of punctuation crime flaunting famed institutions of higher learning. 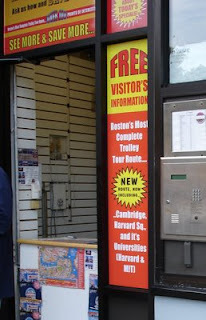 ALSO, "visitor's" information implies the bureau is welcoming just one visitor--perhaps the queen or Angelina Jolie. A quick search revealed the usual names, Visitor Information and Visitors Information. Thanks, Jill! I'm glad you like my blog. Yes, you are right about the visitor's information thing. I took a photo at the supermarket the other day of signs that said "Kid's Juice," so I don't know how I missed this one.